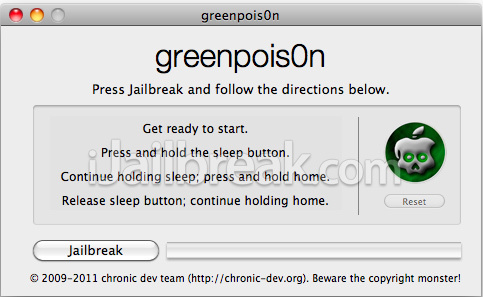 The GreenPois0n Jailbreaking tool was extremely popular during both the iOS 4 and iOS 5 firmware generations. Unlike other Jailbreaking tools created by the iPhone Dev-Team, like RedSn0w and The PwnageTool, GreenPois0n is maintained by a group of developers by the name of Chronic Dev. Some of the most well known members include @P0sixninja, @Pod2G, @Nikias, @AriX and @DHowett. GreenPois0n is a one-click Jailbreaking solution that does not encompass some of the advanced features present in RedSn0w. GreenPois0n simply consists of one screen with a Jailbreak button. Once you click this button the Jailbreaking process will commence and after you put your device into DFU mode, you just sit back and watch your iPhone, iPod Touch, iPad or Apple TV become Jailbroken. A one-click Jailbreaking solution is ideal for individuals who have never Jailbroken before and want to make the process as simple as possible. Jailbreaking tools like Sn0wBreeze or the PwnageTool provide additional features for customizing your Jailbreak, but often times are only used by individuals who are tech-savvy or have had past experience Jailbreaking. It’s not really that these tools are harder to use, but rather that the process takes longer. Besides being a one-click Jailbreaking solution, GreenPois0n is also cross compatible with both Mac OS X and Windows. This means there is no segment to its userbase, and because of this fact it is an extremely popular Jailbreaking tool for older devices and firmwares. GreenPois0n is compatible with older generations of the iPhone, iPod Touch, iPad and even Apple TV, as well as various firmware versions dating back all the way to iOS 3. Unfortunately however, GreenPois0n has not been maintained past iOS 4.2.1/4.2.6 because it was replaced by the Absinthe Jailbreaking tool. If your iOS device is still running one of its supported firmwares however, it is a great tool to use. As mentioned previously, GreenPois0n is maintained by a group of developers by the name of Chronic Dev. As such you can always find the latest version of GreenPois0n from their website. iJailbreak also maintains a downloads section that contains the latest version of GreenPois0n. 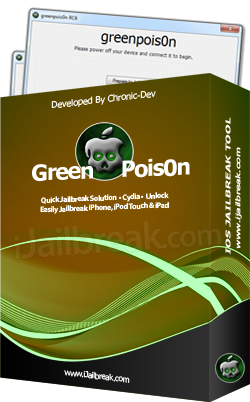 Simply visit the iJailbreak Downloads Section and download the version of GreenPoi0n that is bold. This signifies that it is the latest version. keep in mind however, that GreenPois0n RC1 – RC4 supports the 3.2.2 to 4.1 firmware versions, while GreenPois0n RC5 – RC6 support the 4.2.1 to 4.2.6 firmware versions. The advantage to using a Jailbreaking tool like GreenPois0n is that you do not lose any data on your iPhone, iPod Touch, iPad or Apple TV after Jailbreaking. This is because GreenPois0n does not erase any data during the Jailbreaking process. Some Jailbreaking tools like Sn0wbreeze or The PwnageTool require you to restore your device to complete the Jailbreaking process. This results in all the data on your device being erased. Although this method of Jailbreaking has its advantages, it is inconvenient to lose all your data and thus GreenPois0n is ideal for those who do not fancy having to backup everything on their device. Unlike Jailbreaking tools like RedSn0w that are consistently updated to support Jailbreaking new firmware versions tethered – a type of Jailbreak that means your iPhone, iPod Touch or iPad will not reboot without the aid of your computer if it loses power – GreenPois0n only supports Untethered Jailbreaks. This means your iOS Device will function as normal once Jailbroken and will not require the assistance of your computer to reboot. There is actually a specific way that GreenPois0n needs to be launched on both Windows and Mac OS X. If you are running GreenPois0n on Windows you will need to ensure you grant it administrative privileges by right clicking it and selecting the ‘run as administrator option’. On Mac OS X 10.8 Mountain Lion, because of the new Gatekeeper software, there is also a trick to running GreenPois0n. You will need to first hold down the control button and then select the ‘open’ option. Jailbreaking with GreenPois0n is an extremely easy process and you will probably be surprised at just how easy it really is. iJailbreak has written numerous guides for Jailbreaking your iPhone, iPod Touch, iPad or Apple TV with GreenPois0n that can be accessed from the How To Jailbreak Section. These guides include screenshots, and are specific to each firmware version GreenPois0n supports. As the Jailbreaking process with GreenPois0n is the same for all firmware versions however, you can follow the generalized guide below as well. The first thing you will need to do is download GreenPois0n. As mentioned previously this can be done from either the iJailbreak Downloads Section. Keep in mind that GreenPois0n RC1 – RC4 supports the 3.2.2 to 4.1 firmware versions, while GreenPois0n RC5 – RC6 support the 4.2.1 to 4.2.6 firmware versions. Next you will need to plug your iPhone, iPod Touch, iPad or Apple TV into your computer via USB and ensure that it is powered off. Once you have done this launch GreenPois0n; keeping in mind the points discussed previously on how to launch GreenPois0n correctly on both Mac OS X and Windows. Once you launch GreenPois0n, if you are Jailbreaking the Apple TV, click the YES button in the ‘are you Jailbreaking an Apple TV?‘ window. Read through the instructions shown on-screen for putting your iOS Device into DFU mode. Make sure you are comfortable with the instructions, and when you are press the Jailbreak button to begin the Jailbreaking process. Upon clicking the Jailbreaking button continue following the on-screen instructions for putting your device into DFU mode. Once you put your iPhone, iPod Touch, iPad or Apple TV successfully into DFU mode GreenPois0n will recognize the device and begin Jailbreaking it. DO NOT use your computer or touch your device during this process. After the process is complete and your iOS device reboots into a working state, unlock the device and on the home screen you should see a Loader icon. Tap this icon to launch the Loader app and proceed to installing Cydia (This does not apply to the Apple TV. The Apple TV does not have a 3rd party software management system like Cydia and thus you will need to install tweaks/apps through Terminal and SSH). You are now done and your device is Jailbroken! Congratulations. GreenPois0n makes Jailbreaking extremely simple for even the most technologically illiterate person. Hopefully this in-depth analysis of GreenPois0n has come in handy. Keep in mind that GreenPois0n was replaced by Absinthe and for newer firmware versions/devices it is your go-to tool. does jailbreaking ruin your ipod??? please let me know where I could download absinthe vO.3 for windows for free. can greenpoison work on ipad2 (wifi+3g) ios 5.0.1. because all the video on youtube show ipad2 ios5.0.1 (wifi only). i like your name and yes it can if your not careful with what u get off the cydia store. anybody know how to do it from linux?? i have jailbroken ipod touch 3rd gen 8gb, now how can i download paid appps for free? where can i download great themes for my ipad 2 ?? is downloading this a good idea? no fag, just get the rocky racoon.